I took the above photo while the waiter at Cacio e Pepe prepared my pasta. I mean, come on – a parmesan bowl! Need I say more? In the spirit of full disclosure, that is actually a pecorino romano bowl, and no, I did not get to eat out of it (darn). But I do have a soft spot for dinnerware of the dairy persuasion, and my recent visit to Cacio e Pepe did not disappoint. It was a balmy weeknight, and my eating buddy and I ate outside. You can see that the outdoor dining area isn’t much (unless you count the lady in the green sweater, who I’m sure was thrilled to have her picture taken). But we weren’t there for the ambience. We went straight for the pasta. I ordered the Tonnarelli Cacio e Pepe, which is prepared tableside, as shown in the first photo. Consisting of homemade pasta tossed with pecorino romano cheese (scraped straight from the wheel!) and whole black pepper, it is piquant, creamy and rich. I admit I was disappointed that the portion was a bit small, but then again, I’m a pig. 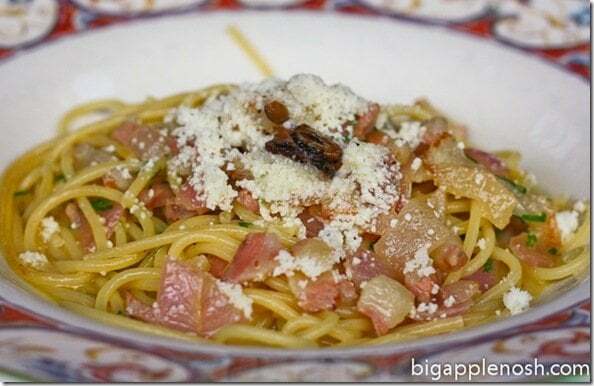 I forgot the exact name of my eating buddy’s dish, and it’s not online (it seems as though the restaurant forgot to renew its site domain name – uh oh), but as you can see below, it involved cheese, olive oil, and a bacon/pancetta/lardo type product. I do remember reaching over quite rudely to eat off her plate. Repeatedly. 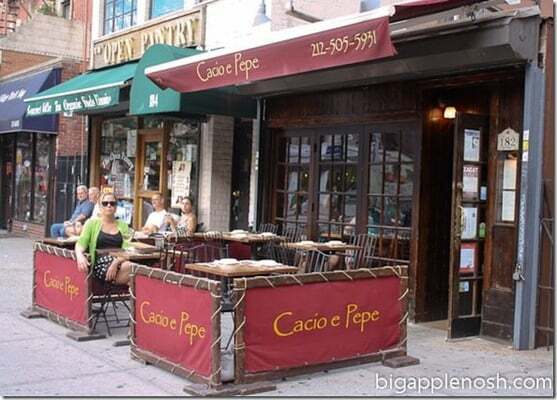 Overall, the ambience at Cacio e Pepe is…fine. The service is passable. But really, who am I kidding here? I’m going for the big wheel of cheese. Yumzo. Do you like cheese? (! thought so). 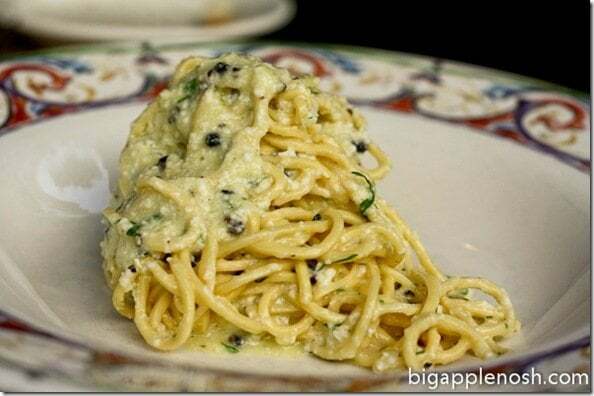 Then you’ll like Cacio e Pepe. I am in love with that wheel of cheese. Cheese makes every meal delicious! If only they'd bring back the parmesan foam. That was my whole reason for going there. I love pasta of any kind, your dish looks seriously delicious. Crap. I wish I had known that you can have bowls made of cheese. I would have registered for one. ooh pasta and cheese. and there goes the pavlovian saliva. Ypur dish looks so yummy! And a parmesan bowl? Count me way in! your pictures always look so yummy! what camera/lens do you use? My icecream craving just got run over by that cheese wheel. I've eaten there! but I didn't have the wheel of cheese. I have been to another place where they used an actual parmesan wheel for the same purpose. I still dream about it! The parmesan bowl reminds me of our latest trip to SF! There's a place in North Beach that serves pasta out of one. Delicious! OH.MY.GEEEE. A Parmesan bowl? Hollowing that out with a spoon? 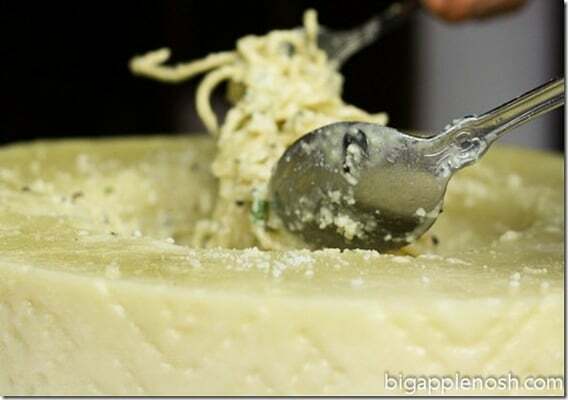 A spoon in Parmesan smacks of decadence for some reason! Christina and Layla – I LOVED the parmesan foam! I don't know why they retired that dish. Hi Anonymous? Do I know you? 🙂 I use a Canon rebel dslr, with a 50mm 1.8 lens. I'm totally figuring it out as I go! Looks delicious with all those cheese there. I don't eat a lot of cheese but love it in pasta though. Why can't everything come in a parmesan cheese bowl? drool! I love the parm bowl!!! It must've been so flavorful! Oh my gosh. A bowl MADE OF CHEESE = best idea ever. I want a parmesan cheese bowl!! Insanity. Love.